In a large bowl mix the ground beef, sausage, 1/2 of the chopped onion, 1/2 cup A1 steak sauce, 1/2 cup JD BBQ sauce, and 2 eggs. Season with black pepper, salt, onion powder, Italian seasoning, sage, basil, and cayenne pepper to taste. Mix by hand until everything is thoroughly mixed. In another bowl mix crushed wheat crackers, chopped celery, chopped potato, 1/2 of the chopped onion, 1/4 cup A1 Steak Sauce, 1/4 cup JD BBQ Sauce, and 1 egg. Season with black pepper, salt, onion powder, Italian seasoning, sage, basil, and cayenne pepper to taste. Mix by hand until everything is thoroughly mixed. On a piece of wax paper, lay your meat mixture out flat in a rectangle shape. Make sure that it is not too thin; try to keep it about 1/2 inch thick. Lay your stuffing mixture on top of the meat and spread mixture to within 3/4 inch of the edge of the meat. Using a jelly roll technique, roll your meat mixture up ensuring the stuffing stays inside. Seal all edges and any cracks that occur in the meat. 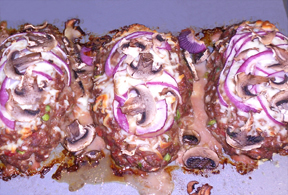 Place meatloaf on a lightly oiled baking dish or a cookie sheet with raised edges that are at least 1/2 inch high. 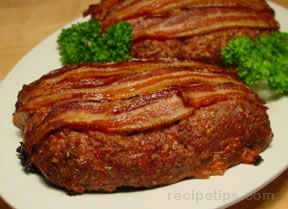 Cook meatloaf for 45 minutes. While the meatloaf is cooking, in a small sauce pan pour in 1/4 cup A1 Steak Sauce, 1/4 cup JD BBQ Sauce, 1/2 cup orange juice, 2 tbsp hot sauce. Mix sauce together and bring to a boil over med-low heat. 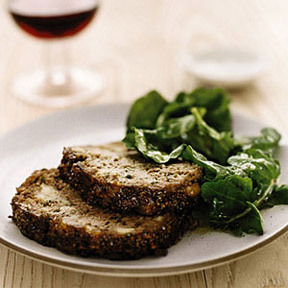 After the meatloaf has cooked for 45 minutes, pour sauce over top of the meatloaf and cook for another 15 minutes. Remove from oven and let cool for 5 minutes. Enjoy! 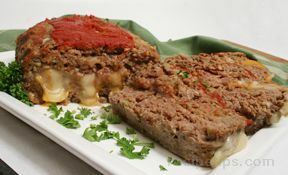 "Best Meatloaf that will definatly hit the spot!"